Last time, I shared the idea how to make Blue and Yellow Adenium flowers. Today I would like to share another idea of making a new trend of Adenium flower with dusty style on Orange Multi-Overlapping petals. Most of Adeniums we see are plain color, border, stripe, and splash. It’s hardly to find the “Dusty or Multi-Tiny spots Characters” so we need to change the way of crossing from “Back Crossing” to “Double Crossing with different parents”. This method will help you to produce new variety not only still have some mother’s characters but also create some newer characters show up in next crossing’s generation. 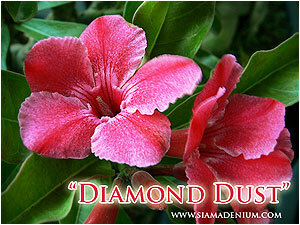 Our first Adenium with dusty flower was called “Diamond Dust” released on year of 2008. 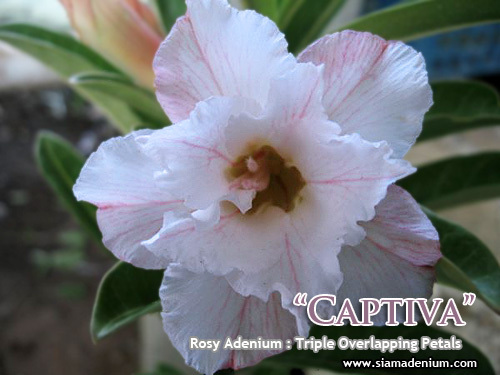 She came from “Adenium Crispum” developing. Her flower mostly has a couple clear red stripes from throat to end of petal. There is also some small area of tiny spots or dust besides the stripe area. This was our start to produce this dusty character. We need to make this spot area to spread more and clearer to become with better dusty style. 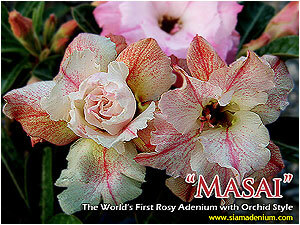 was “New Rosy Adenium with orange petal and dusty style. This would be the new innovation and biggest revolution in Adenium’s world. 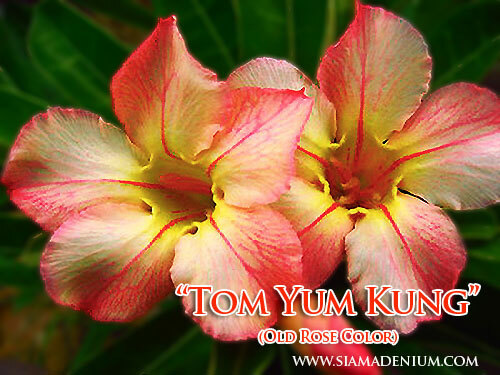 I started crossing again with “Tom Yum Kung” as mother and Rosy Adenium: “Captiva” as father (pollen) on the beginning of 2010. Now this time is success. The result is new Rosy Adenium with soft orange petal and decorating with orange dusty and stripe like orchid, I gave her name as “Masai”. I was very happy with this work because she was the newest style and color never happened in Adenium world before. As I told you, this is very exciting thing on Adenium because sometimes new flowers from crossing might not show the mother’s characters as you wish but they can show or display in next crossing’s generation. To produce nice Adenium flower is very simple. There are only 2 things to concern; technique of color mixing, flowers matching (parents) in term of characters or form & productive flowers and crossing pollination. Last important thing, don’ forget to test the flower’s stability again to make sure new flower is the same characters. Please don’t give up on your work even not get new flower as you wish. 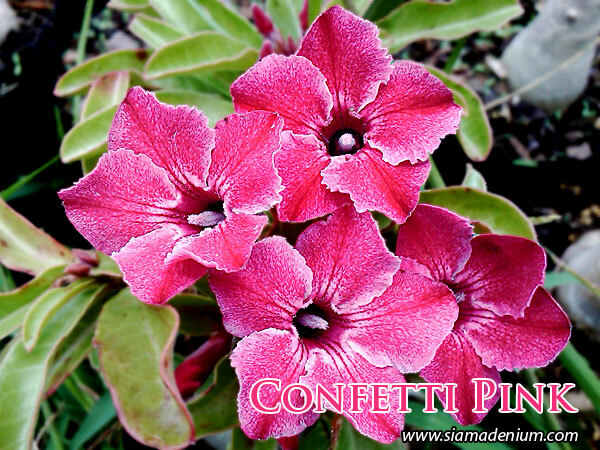 Ok, I think that’s all for today, I hope you enjoy growing Adenium and have a nice weekend.